Knitting, knitting, knitting. At this moment, many of my needles hold projects in the making. I am working on a luxurious cashmere wrap for my mom for Christmas. Shhh, don't tell. It is a wonder to work with the ultra-soft yarn, but it is also a super duper simple pattern. Too simple if you ask me. It kind of puts me to sleep. I like something that exercises the brain. Math...oh, love math too. Hopefully this Christmas gift will make it in the mail this go around. (I purchased the kit of cashmere wool in time to make something for LAST Christmas, but somehow we didn't even have the time to cast on.) I hope that by starting before school starts, and that cool crisp-gotta get my knitting fingers in gear weather comes upon us, I might actually get to complete this project. Really now! In other thoughts about giving back, knitting for charity, and the like, I found, via Facebook, this organization: KnittingforCharity.org. Has lots of information about different charities out there, free patterns for a variety of items, and lots of encouragement for the knitter wanting to donate his or her time to a good cause. They post national and local campaigns, and they get the word out year round. No seasonality here. (Just like knitting a cashmere wrap in the damp 103 degree Virginian heat of August.) The sites they link to are not always up-to-date...so contact the organizer before sending off your hard earned work. Like I've said on my Giving Back page...these bits are primarily for me to keep track of where I've gone, and where I'm headed. I love crafting and creating of all sorts...and there are so many people out there who need the work of a solid seamstress. 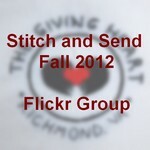 So if you are reading and you know of a charity that could use hand-made goods, knitted, crocheted, sewn, etc. Leave a comment! Thanks.